American Society of Professional Estimators (ASPE) Chapter 32's April 2019 Dinner Meeting Event will be the 2nd Annual Construction Trivia Night. 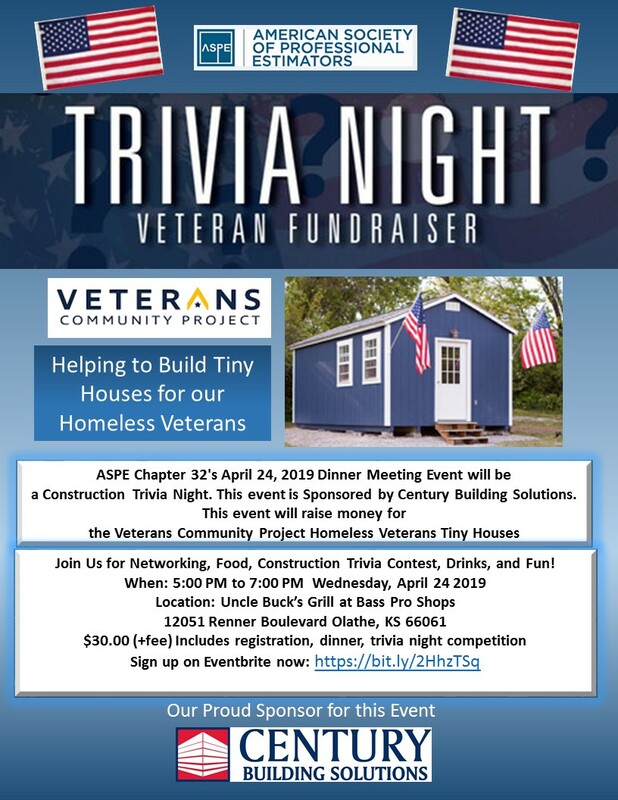 This event is a fun fund raising event for the Veterans Community Project (VCP) Homeless Veterans Tiny Houses project, Door prize drawings will be done throughout the event. Plenty of Networking Opportunities with General Contractors, Subcontractors, Estimators & Project Managers. The Master of Ceremonies will provide a fun and exciting atmosphere for the 4 Round Construction Trivia contest with prizes for the winners of each round. Pay the MC $10.00 and he will do a Commercial for your Construction Company or Project. A 50/50 Raffle will provide an opportunity to donate and win cash. $5.00 Raffle Tickets will be available for the Grand Prize. The Construction Trivia questions are geared to challenge General Contractors, Subcontractors, Suppliers and others involved in the construction industry.. Enjoy being photographed in a Social Media Photo Booth with friends, clients and Co-Workers. Join American Society of Professional Estimators (ASPE) Chapter 32 for our May 2019 Dinner Presentation on the grey areas in Ethics of Construction Estimating and Bidding. Ethical Scenarios in construction bidding are to be discussed along with a few of the dilemmas experienced by General Contractor and Subcontractor Estimators on a day to day basic. Following the presentation a panel discussion of Estimating Experts will discuss some of the issues they need to navigate on a regular basis and their approaches for presenting a fair bidding environment. This presentation is part of Construction Estimator Education Series hosted by American Society of Professional Estimators (ASPE) Chapter 32. Colin Quinn is a Construction Attorney with Long & Robison, LLC. He focuses his practice almost exclusively on construction litigation representing contractors, subcontractors, owners, suppliers, and developers in state and federal courts and in private arbitration and mediations. He has significant experience negotiating construction contracts, drafting mechanic’s liens, filing lawsuits and pursuing payment claims for his clients, as well as negotiating dispute resolutions. Colin graduated from Kansas State University with a degree in Construction Science and Management in 2010. He his J.D. from the Washburn University School of Law in 2013 and currently is licensed to practice in Kansas and Missouri. Success on any construction project requires prompt and complete payment for the work performed. All contractors need to be aware of the tools available to protect themselves in the event a payment disputes arises. Attorney Colin Quinn of the law firm Long & Robinson will present on topics that include mechanics liens and lien enforcement, contractual rights to payment, dispute resolution, and the various laws in Kansas and Missouri that a contractor can utilize to maximize its recovery in the event of a payment dispute. Long & Robinson is a boutique construction law firm, representing contractors, owners, and suppliers in all types of construction-related disputes. Refunds will be offered up until 7 days before the event, after that please send someone else in your place. 1. Site Safety Review Flights. Discover the costs (or cost savings) for Senior Safety Managers to monitor multiple jobsites for Safe Practices quickly and remotely with digital clarity from the comfort of their offices using drone videography and photography. 2. Monthly Project Progress Drone Flights for Pay App Verification. What is it the cost for unapproved pay apps due to lack of photo documentation? 3. Thermal Imaging to detect Roof Leaks, Potential Cold Spots in building or Hot Spots in Electrical & Mechanical Equipment. The costs for these services can have enormous Returns on Investment when major problems are detected. 4. Site Logistics. Site Logistics planning aided with Drone Captured information can eliminate unneeded equipment & material movements and help contractors coordinate their work better. 5. Maintenance Inspections. Drone flights can help site personnel avoid costly and time consuming maintenance inspections of high elevation structures such as Bridges, Roofs, Towers and Scaffolding without leaving the ground. 6. Construction Site Inspections. Builders can turn sensor data into 3D Models, Volumetric Measurements, and Topographical Maps allowing construction workers to track Construction Site Progress with extreme accuracy. 7. Commercial Real Estate Developers. Drone technology is allowing Developers to create stunning, hi resolution promotional photography, site progress photography for investors and bankers and this data can improve site safety and help keep projects on schedule and budget. 8. Point Cloud Laser Scanning for 3D Modeling. Drone Laser Scanning is used to capture the exact detail of buildings, cityscapes, topography to create Building Information Models (BIM) formerly unavailable except at great expense. 9. Decrease Labor Costs. Commercial Drones/Unmanned Aerial Vehicles (UAV’s) are in a position to replace $130 billion worth of human labor across different sectors according to a study by PricewaterhouseCoopers (PWC). 10. Real Time Jobsite Construction Communication Management. Drone Inspections enhance overall project resource efficiency and increase the security of workers. Data from Drones allow construction teams to rapidly fix problems in construction site material deliveries and storage, anticipating hazards, and providing clients with constant and consistent updates on the progress of a project. We will provide refunds until 5:00 pm on Wednesday June 22,, 2017. After that you are welcome to send someone else in your place to enjoy an italian lunch and the presentation. Bring a Laptop, Tablet, pen or pencil with you to participate in the exercise our Presenter will be administering. Crystalline silica dust is nasty business and can be incredibly harmful for employees who regularly breathe in the dust during their work day. Protecting workers from these hazards should be fundamental and these new OSHA rules should not come as much of a surprise. Most commonly silica dust is created from drilling, breaking cutting, tuck-pointing or grinding materials such as concrete, brick, rock and stone. June 23, 2017 is the deadline for construction (technically in effect June 23, 2016 but OSHA fines start in 2017. Other industries will be following in 2018 such as industrial, fracturing and maritime. Construction Estimating Academy on Friday, February 7th, 2014 will be held at the Builders' Association Training Center starting at 7:30 am with a catered breakfast and keynote speaker.